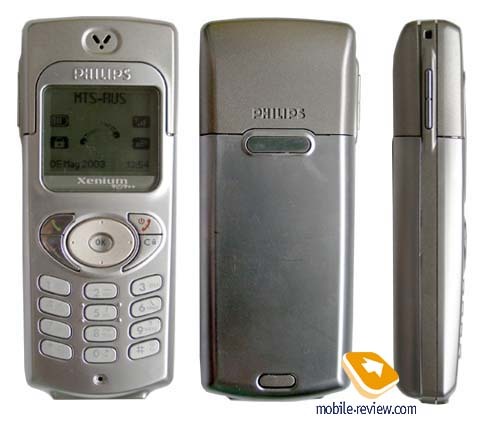 Several years ago in the market has appeared Philips Xenium which differed simply fantastic operating time in standby mode. The phone worked about two weeks at small number of talks or about one week at more dense dialogue. Taking into account the quality of cellular networks covering for that moment, the device suggested impossible long life far from the charger. On the operating time this model had no competitors. Today the covering of networks has improved, the operating time of the majority of mobile phones has increased, but the operating time of Philips Xenium is still close to maximal. It is a pity, but the company has stopped releasing this device, there were no analogues some time, and now appears the updated model Philips Xenium 9@9 ++. The device is executed in metal case, designers have played up the nobleness of silver and the dullness of bronze. Depending on combinations differ two color decisions, in one the prevailing color is silvery, in other - bronze. The use of metal in design has not affected strongly on the device's weight, its weight makes 93 grammes. 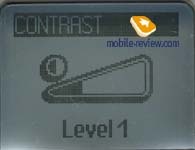 When you take the phone in hands, the covering cools them pleasantly, validity and certain mass concentration are felt. The phone has a character, this is a man's model, which is on hand to men. The sizes of the phone are average (109х43х18 mm), that allows carrying phone, as in pocket of a shirt, and in jeans. By and large, this is a rare combination of the size and mass, it will like to everyone who likes to feel phone in hands. 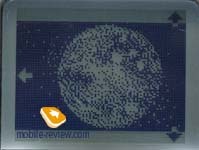 The phone has classical, rectangular design, here the company has remained true to the ideas shown in the first model. 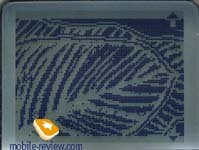 The screen has white backlight, same, as in Philips Fisio 625. In general between these two models is traced much in common, the same platform is used in them so the functional stuffing also coincides. 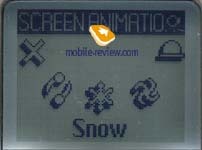 So, the screen displays up to 6 lines of text or 4 lines of text and up to two service lines. The size of the font is comfortable for viewing. In the device there is a 4-item navigating key, it is executed from plastic, but it is extremely similar to metal. Inside of this the key is inserted Ok button, as a whole the design of managing elements is extremely convenient and facilitates the dialogue with phone. The numerical keyboard is also executed from plastic, keys are average on size, and there are no inconveniences while pressing them. On the left lateral surface there is a coupled key of volume adjustment, at the bottom end face it is possible to see the system connector. And some words about the most interesting part of the device, its the battery. 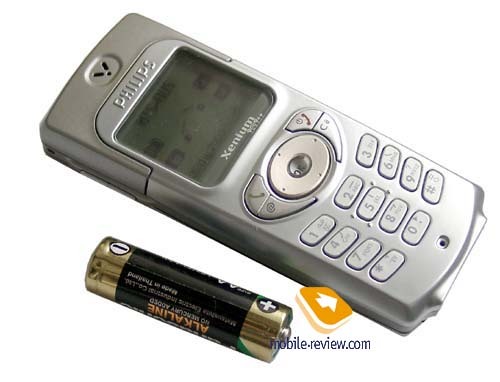 In this model is applied lithium-ion battery in capacity of 850 mAh. According to the statement of the manufacturer it provides up to 750 hours in standby mode and up to 7.5 hours in talk mode. 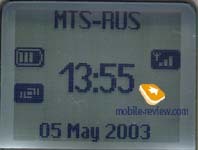 In conditions of Moscow MTS network the device has worked 8 day at 50 minutes of talks and about 35 minutes of other functions using. If to refuse of additional opportunities in Moscow networks the device is capable to work up to 12-13 day at 40 minutes of talks (the data of the synthetic test). Time of the full charge is about 3 hours. The organization of the menu and all opportunities of this model completely coincide with those for Philips Fisio 625. I presume to quote an extract from the corresponding review, only having added, that the navigation through roundabout menu in this model due to the navigating key is extremely convenient, a rare case. 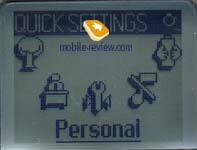 The organization of the menu is typical for phones from Philips - the main menu represents a number of animated icons, located on circle, with the help of navigating key you can move through the menu. 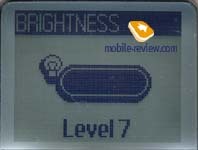 The exit to the top level is carried out only on C key pressing. If to try leaving with the help of release key as in phones of all other manufacturers, it will turn out nothing. There is no fast navigation by menu items with the help of shortcut numbers. As its partial replacement serves the opportunity to appoint for 8 keys shortcuts to menu items. 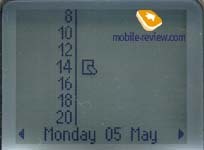 So if to press 5 in standby mode the calculator will appear. It is necessary to remember, that the more menu items you will appoint to keys, the less numbers for fast dial you can choose, these opportunities are combined in the device. Practically all submenus are submitted also as icons, located as circle. If you frequently use the functions hidden inside the menu you should work a lot with joystick or appoint labels to these items voice. In memory of phone there is an opportunity to keep up to 40 voice labels, they can be used for access to most frequently used menu items. Then the big enclosure of the menu ceases to play a role, it is only important to re-form for this feature using. Phonebook. In phone's memory it is possible to keep about 300 names, to fill in for everyone such fields, as name and surname, up to 5 numbers and one e-mail address. To get in phonebook from standby mode is possible, having moved joystick downwards. 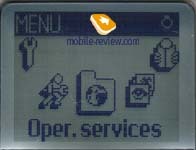 At once is displayed only the phonebook from phone memory or from SIM-card. In the list are displayed only names and surnames; if an entry doesn't locate on the screen it is automatically scrolled. 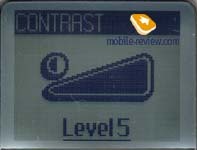 For the highlighted entry on the right is displayed the icon of phone type, it is possible to choose other phones for the chosen name with lateral moving. Even if they are not present, the arrows near to the icon will be active. In the list first displays the phone number which you have entered the first in phone's memory, it relieves of necessity to appoint separately default numbers. To call on chosen number, it is enough to press call send key. 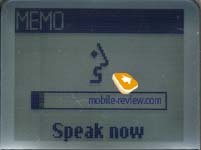 From the menu which appears on joystick pressing it is also possible to make a call with handsfree using. But to see the number, it is necessary to thumb through half of this small menu. If it is necessary for you to consult sometimes, what phone number it is entered under that or other name, it is necessary to glance over the menu. The same operation is required, if you want to appoint to separate numbers a voice label (up to 40). Recognition works well, except for that moment that it is possible to appoint the same word to different numbers. In this case the phone will always call the last entered label, another will be stored in memory, but will never work. There is a search by the first letter or name in the total list. Repeated pressing does not result in anything, it is necessary to thumb through the list even for one name to enable again the fast search by the first letter. It explains the fact that it is possible to search for name by all letters, i.e. for example for surname Ivanov we press 4 (ghI)-8 (tuV)-2 (Abc). 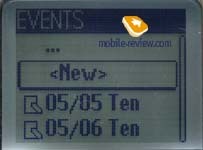 For 10 groups of subscribers it is possible to choose not only the melodies, but also pictures (PhotoCall), further at incoming call they will be displayed on the screen together with the caller's name. Messages. One can read received messages and create new ones in this submenu. 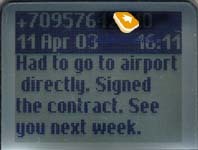 When viewing the list of messages, each chosen message is automatically completely displayed (running line), and when opening the separate message it is also automatically scrolled, but already in full screen mode. It is rather interesting and curious. There are 10 templates in English, all is traditional. 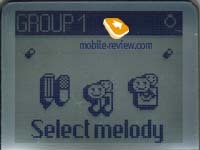 With the message it is also possible to send one of many icons or simple melody (EMS). In this device has appeared the opportunity to keep the message in SMS-archive, and also to place automatically the written messages in folder with stored messages. WAP. When you get into the main menu you get exactly on this item, the developers have considered, that it will be the most popular. Access to wap-browser (one more submenu), and also access to service numbers disappears inside. There is no anything interesting, the wap-browser of version 1.2.1 works equally how it is necessary to it. Picture Album. The list of pictures installed in phone, by default there are 5 of them. All are stored in jpg format which is supported by the device. You can see the current picture, choose one of images as background standby mode. From a picture or their sequence it is easy to create the screen saver. Last two problems are solved through the options menu. In the same list it is possible to see icons which are used for EMS messages creation. E-mail. Built-in E-mail client supports 2 mailboxes, works as with POP3, and SMTP. 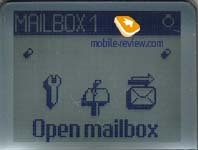 There is an opportunity to adjust reception of mail through GPRS-connection, as a whole it is nice, but attachments are not supported (except for jpg), Russian coding behind exception of ISO it does not understand. Messages that in the size are more than 7 KB are not accepted. Call list. The call list, it is common, i.e. in it locate both received and dialed or missed phone numbers. You can view date and time of each call if you like. In the list can be up to 30 records, it is called from standby mode by moving joystick upwards. Numbers from the list can be used precisely the same as from the phonebook (messages, details viewing, etc.). Organiser. As well as follows from the name, the organizer disappears here. There is an opportunity to see calendar for month and, week. 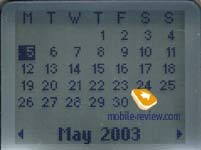 When viewing calendar for month are marked all the days for which there are events, and in week view there is a breakdown on days and opposite each day the event icon is displayed. There are events of three types: meeting, rest and business. For each record is entered the date started and the date closed, events can be repeating (day, week, month, year). Also is adjusted the warning for event. There is just one trouble, events at operation demand confirmation, it sometimes irritates. There is an opportunity to remove old events. As a whole the organizer is comprehensible, but no more that. Organizer and phonebook memory is allocated dynamically. A surprise - 300 records in the last one, are possible only in case if there is organizer records in general. The general number of records for phonebook and organizer is limited - 300. Extras. 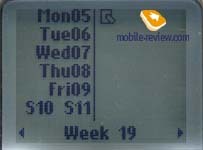 In this menu are located some useful functions, for example alarm clock. It is possible to adjust it on unitary, daily or “only on working days”. The calculator is rather simple, without refined functions. Call counters. Here are collected every possible call counters, both for GSM, and for GPRS. 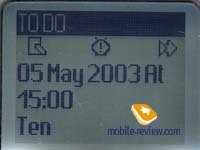 For some reason for voice calls it is possible to look only time of all outgoing or incoming calls, general time is not displayed. 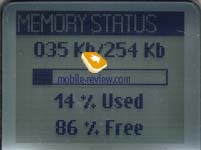 Memory Status. 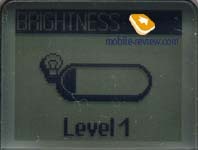 Shows phone memory status, there is a diagram, all is enough evident. To find out, what quantity of records (in pieces, instead of percents) in this or that section it is necessary to press some times on Ok, the corresponding menu will appear. Memo. Dictophone. It is possible to record only one fragment up to 30 seconds, an attempt to record one more fragment will result in deleting of the first one. The dictophone works during conversation. Dictophone record can be used as ring tone. Brick game, rather simple, it’s the unique in phone. Settings. Here all is simple: it is possible to adjust safety levels (a traditional set), to setup one of the 5 themes for the display which change appearance of windows, to setup the operating time of backlight (till 1 minute) to adjust the screen saver, etc. All adjustments of call are hidden here, it can be one of 30 melodies (+ 1 received), vibration alert, the mixed mode. Are interesting adjustments of equalizer which operate during conversation, there are 5 of them. 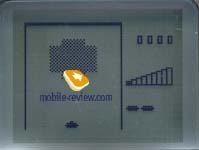 They have appeared due to the ARM-codec, this is practically the first phone with its support. The problem consists that the operator should support this function, my attempts to change adjustments and to hear a difference have not brought success, the sound in speaker has remained precisely the same. Quick Settings. Various profiles locate here, there are “Meeting”, "Silent", "Personal", etc. The problem consists that adjustments of all profiles are unchangeable, they are initially installed in the phone. There is a list of changes in the instruction, characteristic for each profile, probably, it is necessary to learn it or rely on intuition. Philips Company has made the excellent remake of old model, this device distinguishes reasonableness of design, severity of lines and excellent operating time. There are no problems with the sensitivity of the device, from fine lacks it is necessary to note the presence of parasitic noise in speaker during conversation. 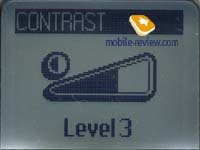 Its level does not depend on the adjusted volume level and present always. The developers have promised to remove this lack by the moment of commercial start of the device. The sound in speaker is alive, sated. Handsfree function is realized in traditional way. It is efficient in rooms, but only it is required from it. The loudness of ring tone is average, it usual, not polyphonic. 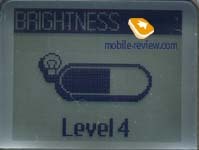 Vibration alert is also average on force, but it is felt well if the phone locates close to body. The phone will appear in sale in July, the guiding price makes 165-175 dollars. It is necessary to pay attention to it, to admirers of Philips, and also those who feel necessity of strong device with good operating time, and presence of additional functions (IR port, Java, polyphony) does not play a role. In fact Philips Xenium 9@9 ++ has been created first of all for conversation and here it carries out perfectly this function. P.S. In the sample which we had on testing there was no Russian input, during the present moment the company conducts works in this direction to the beginning of deliveries its presence (and also there will be Russian Т9 dictionary) is supposed. From lacks of the given sample we cannot note something serious, the software works enough stably.